1. O’NEILL & FINCH’S NEVAEH BHUPALI (76 30) female. Gentle rounding to top of head with large ears of good set and shape. Large pale green eyes of good shape and expression, set well apart. Very good definition to muzzle with gentle contour to profile and level chin. Super weight and feel to very well grown elegant body with well shaped legs and rounding to paws. 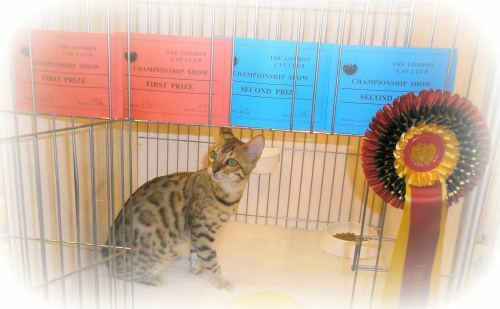 Pale ground colour with mid brown markings and spots of very good definition, spotted tummy. Coat is dense and of lovely texture. Tail is of good length and well marked, could be a little thicker in shape. Lots to say but just chatty no malice and handles well. Very nice girl. 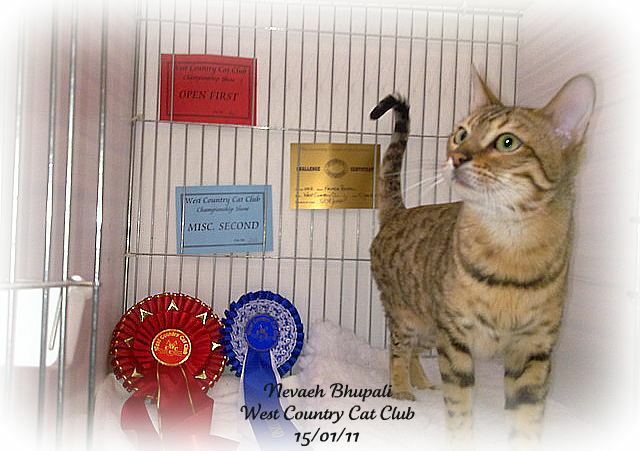 CC O’NEILL AND FINCH’S NEVAEH BHUPALI: A very pretty girl of nineteen months of age with a delightful temperament. Head well balanced being a broad medium wedge, although I would prefer the nose to be a little broader and maybe the head overall a little longer, particularly in the muzzle, although the muzzle itself is full and broad. Lovely clear face markings with a good clear pattern running unbroken over head, down neck and onto shoulders. Profile shows gentle curve to nose line, moderately firm chin and level bit. Ears large with good width between and correctly set. Eyes large in size, rounded in shape with good width between and well set. Super long and strong body, sleek and muscular with an excellent feel to it and carried on medium length strong legs with large rounded paws. Leg markings good and clear and are a mixture of some rings, some slashes and some small spots. Tail rather long and needs to be a little thicker, although does have a rounded tip and a good clear pattern. Coat very nice, short and moderately dense with a soft feel to it. 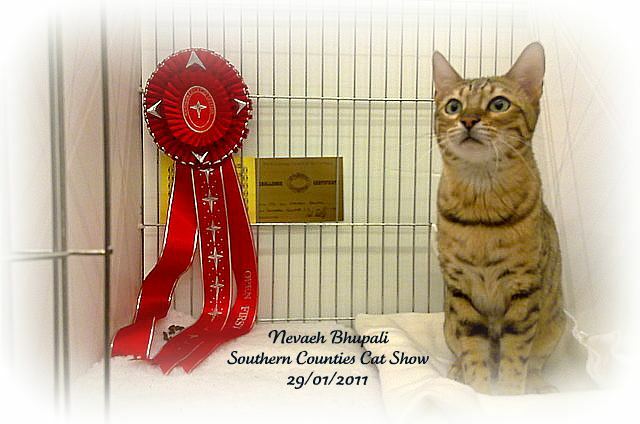 Coat colours a pale gold ground with dark brown medium sized spots, some of which are arrow headed and some with rosettes and all moderately well defined. Tummy shows spots and an underside which is very pale. A nice girl with a very pleasing temperament making her easy to assess. 1st & CC. O’NEILL & FINCH’S NEVAEH BHUPALI (76 30) female. Adolescent girl, pleasing head shape, the ears are of medium size and are well set. Good profile line and chin, the bite is level. Expressive eyes, good hazel colouring. The coat base could be a little warmer in tone, but has spots of various sizes which are well marked. Good facial pattern. Strong well developed body, well shaped limbs, good short thick tail. CC O’NEIL AND FINCH’S NEVAEH BHUPALI: A rather apprehensive girl of just over one year of age. Head generally well balanced, being a moderately broad wedge although I would like the nose to be broader and the muzzle to be a little stronger. Face markings reasonably well defined. One faint chin strap and one necklace. Profile shows gentle curves with a slight dip in the nose line, firm chin and level bite. Ears medium to small in size with good width between and correctly set. Eyes very large and round, although she was very shy of showing herself, and this may have contributed to the ‘big eyed’ look. Body medium in length and moderately muscular. Legs medium in length, strong and muscular with fairly large rounded paws. Leg pattern a mixture of broken rings with small spots on paws. Tail medium in length but needing to be considerably thicker. Tail pattern shows a clear mix of rings and some spots. Coat short in length and soft to the touch although not particularly dense. Coat colours a very pale gold ground with medium sized mid brown spots, some of which were arrowheaded, others rosetted. Pattern not as clear overall as one would like due a fair amount of ticking. Tummy very pale in places, almost white. The very pale, almost white colour was not continuous as there were some much warmer patches between. However the tummy spots were large. A well presented girl with a good temperament but very apprehensive and most of my judging of her was done in her pen to save stressing her further. A gentle girl of 12 months with a soft dense coat. Head a medium wedge slightly longer than wide with a rounded muzzle. Well-set ears and greeny eyes of oval shape. Muscular body with limbs to balance and ringed tail with a dark tip. Large arrowhead spots on a pale background and some linkage in places. Spotted tummy & well-marked limbs. 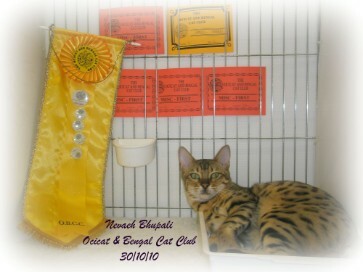 2nd O’NEILL & FINCH’S NEVAEH BHUPALI (76 30) female. A pretty, sleepy young girl. Medium sized ears of good shape and set with gentle rounding to top of head between. Large eyes of good shape and set having good width between. Well defined whisker pads, slight contour to profile with level chin. 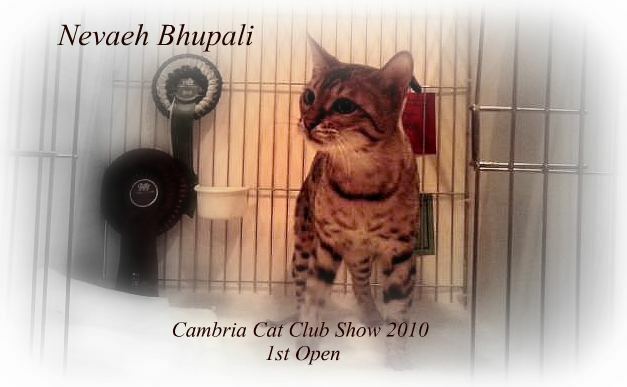 Elegant body of good shape and size, of good weight, with well shaped legs which are well spotted down to paws. Tummy is well spotted with paler area between back legs but does have feint spots. Good texture to coat which shows well defined black and dark brown markings including rosettes and arrowheads. Tail is well marked but would like a little thicker in shape. Lovely nature and in good condition. Laid back young miss with a neat head of balanced proportions being slightly longer than wide. colour and clear well defined spotting. 1st. O’NEILL & FINCH’S NEVAEH BHUPALI (76 30) female. darker brown markings on pale golden coat, pale tummy between back legs but showing spots. Tail is well marked but would like thicker in shape. Lovely nature and in good condition. and large rounded paws. Medium length tail thick and even, carried low, with a dark rounded tip. head. Spots on the tummy. Broad medium wedge with rounded contours and high cheek bones. to the firm rounded chin. Small-medium ears of good shape wide at the base with rounded tip. 1st to O’NEILL/FINCH NEVAEH BHUPALI (76.30) 15.1.10. Long firm body, legs and paws in proportion, tail on the long side and she needs to grow into it; ears short, rounded and well set, balanced head with a curve to broad nose, puffed leather, good broad muzzle with whisker break, good chin and level bite; eyes large, well set, dark rimmed and green colour. Coat short, dense and close showing a pattern of rosettes and arrow heads in black and brown on a buff background with glitter; excellent condition and beautifully presented. A very impressive baby of five months of age whom I met a few weeks back, and wow how she has grown and improved. Head a well balanced, broad medium wedge, just longer than wide. Ideally the nose would be broader. Good full and broad muzzle. Excellent clear face markings with good pattern running unbroken over head, down neck and flowing into a very complex pattern across shoulders. Profile shows gentle curves, moderately firm chin and level bite. Ears rather large although with good width between and correctly set. Eyes large in size, rounded in shape with good width between and well set. Body long, sleek and muscular and well developed for age. Legs medium in length, moderately strong with medium sized rounded paws. Foreleg markings show clear rings at top with spots lower down and onto paws. Hind legs show a mixture of flashes and spots. Tail rather too long and very thin, almost a whip but clearly ringed with a dark tip. Coat short and although with a soft feel to it is not particularly dense. Coat colours a very pale gold ground with black spots, giving superb definition. Spot sizes small to medium, some arrow headed and some rosettes. Underside of body lovely showing small spots on a very pale ground, almost cream, which runs from chest right through to inside of hind legs. 1st. O’NEILL & FINCH’S NEVAEH BHUPALI, 76 30. 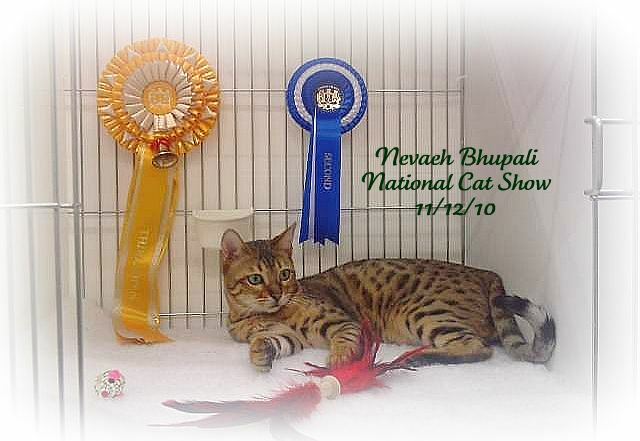 Very lithe and muscular spotted Bengal kitten. Well shaped medium wedge, with well pronounced whisker pads and well set oval eyes. Wide based, correctly set ears. Well shaped body, legs and tail. Beautiful coat, short and dense, soft in texture, with well defined spotted pattern. Rather tense but handled well enough to be assessed. The baby of the group at almost four months of age and up against some formidable opposition. sometime to develop, I think.